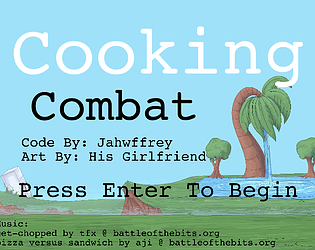 Combat in Cooking Combat revolves around collecting and using the ingredients that drop from enemies. 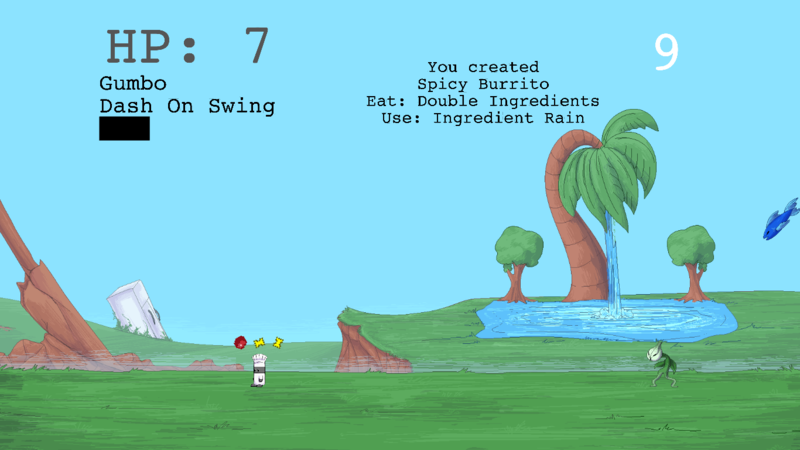 Ingredients themselves can be thrown back at enemies to deal damage from afar, and furthermore hitting an enemy with their own kind of ingredient is an instant kill. If you collect 3 ingredients, however, you can instead cook them together into one of 20 possible dishes. These can either be eaten for a personal power up or activated to debuff enemies, change the battlefield, make special attacks, and more. 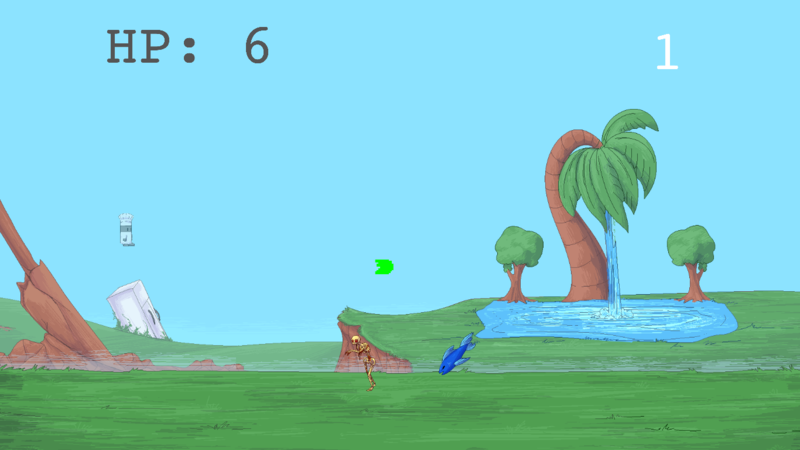 The combat itself is also highly mobile, with each kind of attack having some kind of movement effect, allowing you to bound back and forth between enemies as well as use some enemies to reach others. A fun premise with a cute art style. Using the skillet and ingredients for both offense and mixing up powerups was a strong execution of the theme. The idea is pretty fun and inventive and the action controls get intuitive quite quickly. The controls were a little difficult to handle when we got the bad luck of having too many enemies shooting at us. The cooking crafting part was the most inventive and cool feature, it spices (pun intended) the game in a good way. Great concept, great art, meh controls. That's the easiest part to fix though, so I think you're really on the right track here. OK, that was a fresh concept! The Jump button could be better placed, perhaps the spacebar? 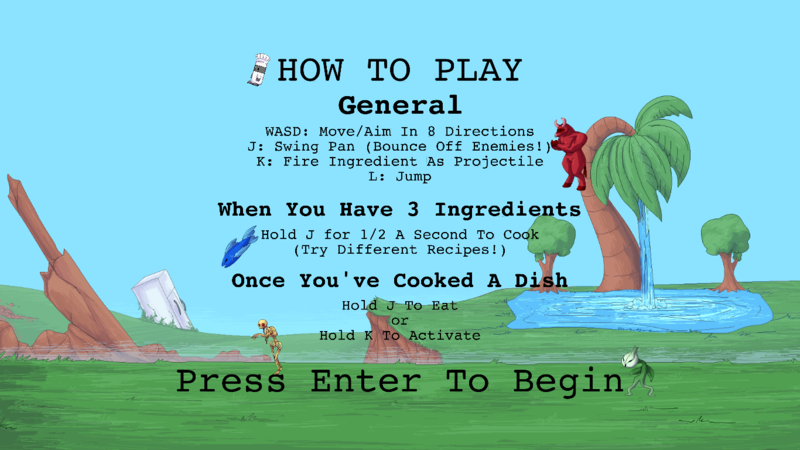 If you simplified the controls it might work better (Instead of JKL, combine to one or two) Needs more "game feel" and juice too. If you had XBox controller support, I think it could help a lot. The keyboard controls aren't my favorite. The concept is cool though, and fits the theme! I absolutely love the idea, combining the enemy types to make your own power up is brilliant. And the decision to how to use the power up is great as well, either eating or using. The main gulf for me was the controls, if you iron those out and maybe give more control over what enemies you choose to kill and some kind of indication as to what the food will be it would be amazing.